Curio Obscura » Blog Archive » Lag 101: What is Lag and Why Does It Happen? << Hair Fair 2009 Begins! In a recent post to Not Possible IRL, Alpha Auer lamented the unfortunate experience she had at Hair Fair 2009. Stuck in molasses, she desperately struggled to move any distance at all. And the molasses wasn’t part of this year’s Candy Land theme; it was lag. What caught my attention was that she tried to reduce the problem by switching off various Render Types in her client and, when that didn’t help, she assumed that the cause of the lag was all of the sculpties being used in the booth decorations this year. Of course, her attempts to reduce her lag failed and the conclusion she drew about the lag of the lag was completely illogical conclusion, based on an all-too-common misunderstanding of the nature of lag. 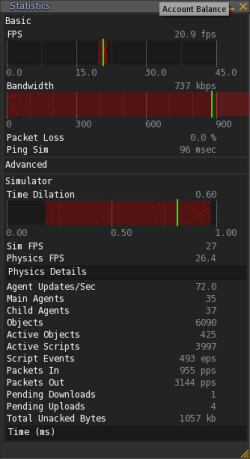 The vast majority of Second Life users seem to have very little understanding of what lag is and what causes it. I have decided to help to rectify this problem with my first Curio Obscura tutorial. Everyone hates lag. Lag drives us crazy when our client gets so bogged down that our dance party turns into a series of still images. Lag frustrates us when we cannot move in the world or we start moving but cannot stop. Lag bores us when we have to wait for ten minutes just to see what is right in front of us. “Lag lag lag… All we do is frickin’ lag!”, we cry. Except we don’t say “frickin'”. We use a less lady-like verb. Let’s consider the situation at Hair Fair 2009. If you have managed to visit the Hair Fair, you will have observed many symptoms of lag. It takes a long time for many of the booths and vendors to fully appear and for their textures to resolve and people can barely move, running in place without getting anywhere. All of which are very common problems with large, popular events. Yep, the main reason for lag at Show and Tell is the avatars, too. Everytime I check the various indicators, it points at the people. The worst that happens to an event is that it actually is successfull. 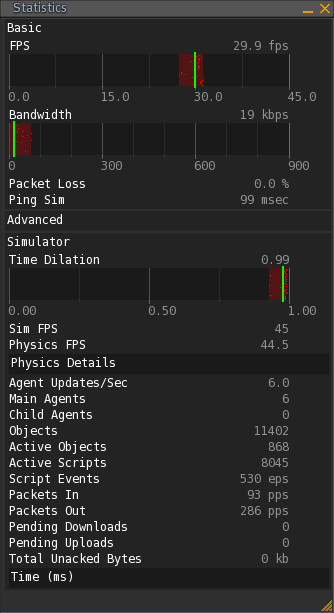 When we hit the 60 visitors, time dilation at lummerland hovers around 0.8 with dips down to 0.4 whenever someone who crashed out relogs into the sim. So big events make people crash, crashing makes people relog or reteleport and avatars entering the sim makes the sim dip into the bad time dilations – which makes other people crash again. It’s what we call a devils cycle around here – no way around it but to ride it out. I have to grant the lindens one thing: it did get much more stable than it has been a year ago. We don’t have those manic swings of time dilation values anymore, a big thing that helped was the switch to Havoc 4 (since avatars are physics, too). If you sit on a prim to move around, does that make the server stop updating for your avatars physics? If everyone sat and rode around, would that help lag? Great article! Very informative and solid explanations. I’m definitely bookmarking this to send to people who have questions or misunderstandings about SL lag. P.S. : A small correction: Anatomy of Lag was actually written by Gwyneth Llewelyn, as a guest post on Ana’s blog. If you are sitting down, you are part of the static elements in the physics simulation. Moving the prim you are sitting on has the same effect as moving a prim you are not sitting on. That is to say that it’s relationship to the rest of the physics simulation has to recalculated each time that you move it but ONLY when you move it. Of course, if the prim you are sitting on is marked as “Physical”, it is part of the dynamic physics so it costs a little more resources and, if the prim is “Phantom”, the avatar sitting on it is still solid so it is still part of the static elements in the physics simulation. Thank you for the correction! I will edit the article right away. I have been saying for a while now that I believe the inability to host large scale events is the greatest problem LL has – business and education, art and music, and everyday socialising are all limited severely by this..
You’re not wrong that large scale events are a problem but it is a puzzle that every MMO system faces and the extreme customizability of SL makes the challenge much more difficult. I honestly don’t know what they could do that would improve the situation. Great article, it was a very nice read. I can assure you that I did my very best on that front! There’s no Listen calls, no timers, no loops, and certainly no detection or collisions used. Scripts I built for the HF vendors and donation kiosks are only active when someone buys something, and the transaction lasts a few seconds. The only overhead is that they do a HTTP request on the HF accounting server, to log transactions. But that was absolutely needed as a feature for tracking accountability. Very very good article, kudos! Pandora, this may be the most useful article on SL that I’ve read. Thank you for taking the time to break it all down for us. GIven how well the vendor scripts worked at the Fair, it is obvious that you took great pains to minimize them. While it is true that the main form of lag people were experiencing at the Fair, the inability to move, could not be caused by scripts, scripts can be hindered by that form of lag so keeping the scripts small, simple, and efficient means that they can operate with reasonable reliance under such adversely laggy conditions. Despite all of the lag, I only had two people report a problem purchasing something with a vendor from me, at Hair Fair 2009. I have seen so many articles on lag, this one actually makes sense and I can understand what really causes lag now. thanks a bunch! I got a question about giant prims – how do they rate? I am not as well versed on megaprims since they are very specific to the Second Life engine but my understanding is that the main danger is megaprims is that the physics engine is optimized to assume that prims are no larger than 10x10x10 and larger prims wind up slowing down the physics simulation. I can speculate that the physics engine optimizes by using some kind of branching tree of smaller and smaller subsections of the region so that it can calculate based on a smaller number of prims at a time. If that is the case, prims that are very large might prevent the system from being to branch into as many smaller sections, forcing the simulation to consider larger numbers of prims at one time, this making the simulation much slower. The Avatar Rendering Cost (Advanced Feature) is excellent to determine how performance-intensive hair is. A friend increased her FPS by 15%, just by switching to a style with fewer flexi prims. But also, you aren’t helpless — the perfomance of your favorite doo can be improved by editing individual pieces that don’t need to be flexi, or transparent. I reduced my Avatar Rendering Cost by 900 (25%) — but it took two hours of editing. For the typical user, a big factor is who else is sharing the server. I’m not sure how SL shares a RL computer between sims, one person said it’s 4 sims to a server, another said it’s 1. The easiest optimization is to pick a property that’s fast. I worked for a major ISP and also for a networking company. Phone your ISP if you like to complain about performance — but apart from helping optimize your computer — there’s a good chance they won’t help. Except for the modem — which likely isn’t the bottleneck — they aren’t going to replace or tune their network performance to suit you. (The guy down the street has 30% better performance from the same company — sometimes that’s just the way it goes — they’re closer to a headend, etc.) A very common misconception is that your own computer plays no part in network lag. It’s very unfortunate that people believe this is true. Buying a faster overall computer will have a dramatic effect on download and upload speed. Buying a better network card, alone, is likely to help. I would like to make a correction. Scripts are not a major source of server lag. In general they only affect other scripts (so scripts can cause scripts to lag). I built an object with 16 buttons (16 bits). Each button had a script which listened to link messages and would move itself up or down depending on the message. The root object then went as fast as it could through all the number 0 to 65,535, giving that number to each button in a link message (16 messages per number). The buttons would look at their bit and move up or down. I had 64 of these running simultaneously. The region stayed at 44FPS or above. All movement of avatars was normal. My huds still worked just fine. Scripts are the last to get resource and hence have the least impact on a region. Further, a listen causes no perceptible lag, it is the chat that wakes up the listen. If you are listening on a channel no one is chatting on you do not wake up. Scripts can start to create lag when they cause physical events to happen that effect the server. There is a lot of folklore about lag in the educated circles. A simple coding mistake in the server code that causes a pruning operation to not prune where it can can have significant effect. Scripters may learn of this by trial and error and then “fix” it in their scripts, after which, Linden Labs fixes the root problem and all those fixes are not needed and it turns out there was no lag from the scripts in the first place. You may guess I am a scripter. People tell me I am a very advanced scripter. I also an a software architect, operating systems designer, and many other things. I do not know how the servers at Linden Labs work. I am sure then can be improved, almost all software can be. There are some bad scripts out there that waste resources, but by in large, they are hurting other scripts.